A couple of decades back. My dad used to ride it. He was the exact replica of che guevara, with his leather helmet. I could easily recognise my dad riding down the hill even if he was half a mile away.He was never fast nor furious. His maximum speed used to be 30 kmph. On evenings the whole David family would be on the scooter. My mom would take the pillion seat and me and my sister would fight it out standing in the front.Our fights ranged from simple verbal clashes to biting and pinching. More often My dad's hand would be on the receiving end because my canine clutches would be missing the target. Days went by and my sister had a new position in the scooter. She was allowed to sit between my dad and my mom. The scooter journeys were always nightmares for my dad as the fight between me and my sister took new forms. He would be the barrier between me and my sister on such occasions. My sister would tickle me from the back and I would retort by pinching her legs.On various occasions, my dad was on the receiving end.If only my dad had a smaller pout , he would not have had to go through such trials. One day the ever so fighting pair of me and my sister, took our war skills to new heights when my father decided that enough was enough. I was made to walk home that day. On another occasion, I was standing in the front as usual and due to my hyperactiveness, I gave a throttle to the accelerator and hey presto, all four of us were on the ground. I also remember the time when I had to puncture my soft bum with a TT injection because , my index finger was badly injured.Apparently , my finger had found its way between the clutch lever. Last week I saw a documentary on scooters on T.V. , and I was taken back down memory lane. 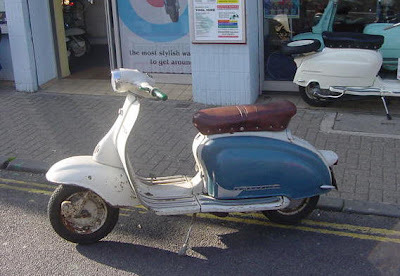 I miss my dad's Lamby scooter. i miss lamby scooters.. my dad had one to and he was also super slow! no one can beat my dad in riding the scooter at such a slow speed.. people can walk and overtake him..
Dad had a green Lamby, but he sold it off because he found it too heavy! : (. The KH though comfortable cannot compare to the good old Lamby.